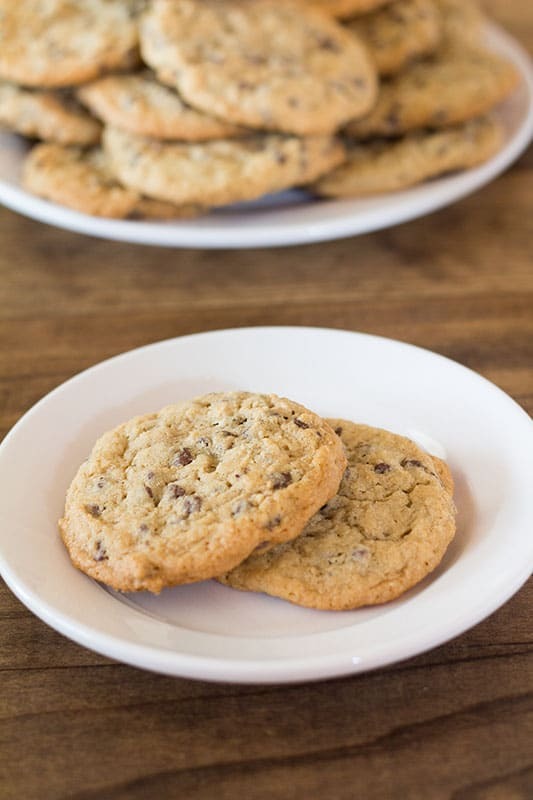 Copycat DoubleTree Hotel chocolate chip cookies. Soft cookies with ground oats, mini chocolate chips, and just a hint of cinnamon. The Seelbach Hotel in Louisville used to serve the BEST chocolate chip cookies during turndown service. I have been searching for this recipe for over 25 years. Since this is a Hilton, and DoubleTree is “by” Hilton, I figured anything called a copycat DoubleTree cookie was worth a try. The ones at this hotel were the thickest chocolate chip cookies I had ever seen. They weren’t gooey like most thick chocolate chips cookies, they were cakey. I don’t really remember there being any oats in them, but perhaps they were able to grind their oats into a much finer powder than my handy dandy food processor can. 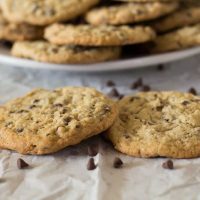 I have been searching for a similar recipe all these years, that’s how the $250 cookie came into my life, and probably the reason I even bought that cookbook, to begin with. Those cookies are definitely in my regular rotation, but they are not the elusive chocolate chip cookie I am looking for. 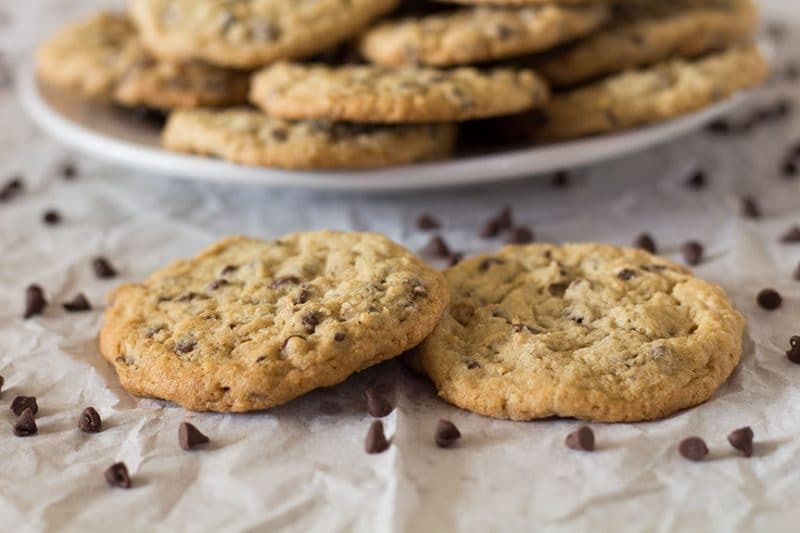 This copycat DoubleTree recipe is not exactly the one I am searching for either, but it does make a spectacular chocolate chip cookie. I don’t use the lemon juice you see in other DoubleTree Cookie recipes all the versions all over the web. I don’t believe that would make a difference in the texture of the cookie. If you think you might like to use it, most recipes call for 1/2 of a teaspoon. I have never cared for nuts in my chocolate chip cookies, so I do not use them in my recipe, but if nuts are your thing, you can add up to 1 1/2 cups of your choice of chopped nuts. I don’t recall nuts in the cookies from the Seelbach either, but it’s been a few years. I shared these cookies with neighbors at the same time as the $250 cookie, and this cookie was declared the favorite by the neighbors, as well as Andy. Me? I’ll take either, never really met a chocolate chip cookie I didn’t like. Delicious chocolate chip cookie with ground oats, mini chocolate chips, and just a hint of cinnamon. In a food processor, or blender, process oats until it is a fine powder. It won’t be as smooth as flour, but somewhere between cornmeal and flour is what I use. Mix oats, flour, baking soda, cinnamon, and salt in a small bowl until combined. Set aside. In a mixing bowl, cream butter and sugars together until light and fluffy. Add eggs and mix until well combined. Stop the mixer and scrape the sides and bottom of the bowl at least once during this process. Add vanilla and mix until well blended. Add flour mixture and mix just until combined. Over mixing will produce tough cookies. Add chocolate chips and mix until incorporated. If using a stand mixer this can done with mixer, if not, hand stirring is highly recommended. Refrigerate dough at least 4 hours and up to overnight. Form dough into large balls, I use a heaping scoop from my 1 1/2 tablespoon cookie scoop. Place into preheated oven and bake for 16 to 18 minutes, or until the edges just start to change color. Allow to sit on cookie sheet for one minute. Remove parchment with cookies still on it to a surface to continue cooling. Once cooled, remove from parchment paper and store in an airtight container. Prep time includes 4 hour refrigerator resting time.